In the modern era of voice-recognition virtual assistants, self-driving cars and smartphones, it makes no sense to be doing something as crucial as maintenance manually. Luckily, there’s software for that! Let’s look at the advantages and disadvantages of CMMS software (Computerized Maintenance Management System), so you have a clear understanding of the benefits of CMMS. First, a quick overview. Computerized maintenance management systems include EAM software (enterprise asset management), CAFM software (computer-aided facility management) and facilities management software. One of CMMS’s advantages as a technology is that it tracks an organization’s maintenance operations and activities. A note about the “managing assets” component: it was once the purview of EAM, a more encompassing management solution that generally includes CMMS functionality. Nowadays, the two are used interchangeably as CMMS grows in scope — many of the solutions listed in our maintenance management software leaderboard are defined as CMMS/EAM software solutions. We wrote another article about the differences between EAM and CMMS and a more in-depth breakdown of what CMMS is if you’d like to know more, but don’t sweat it for the time being. CMMS can track or record an asset’s data, including purchase date, expected lifetime, warranty, specifications, maintenance activities and service history. This data is stored in the asset’s profile for easy access later rather than searching through paper files. The system also logs service contracts, service history, additions, modifications and spare parts. Tracking asset service, mean time between failures, depreciation rates and other lifecycle data helps users keep up with individual asset condition. When an asset is nearing the end of its usefulness, they can plan accordingly to replace it rather than be taken off guard by unexpected failures. Maintenance staff can use CMMS software to schedule work and assign it to specific technicians. By organizing work orders into a stratified queue, everyone knows what tasks need to be completed and who is responsible for them. Once a problem is fixed, the person working on the issue can confirm that they have finished the assignment, and a manager is alerted automatically. Role-based access allows admins to restrict work order closure to managers to ensure proper oversight. 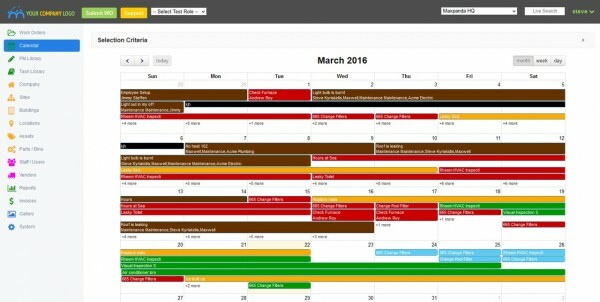 Computerized maintenance management systems also help track external work requests and property maintenance requests like repairs for rental tenants. Maintenance teams can use CMMS to enter work order request numbers automatically or manually. Work request modules then track and record the completion of work. The software can help organize and track inventory as well. Users can track special order items, the location of parts and materials as well as determine whether items are stocked or not stocked. You can also follow the movement of inventory, including items that move from one site to another or the levels of stock within a facility. A computerized maintenance management system can also help provide information about the cost of an item or the item’s substitute. Certain CMMS inventory control modules help inform maintenance teams of what tools are available, track the movement of tools, manage the tool room and assign tools to workers. CMMS software also promotes safety on your site. It helps manage permits within the system for easy access and sharing. It documents safety plans and compliance requirements such as electrical safety, foreign material exclusion, lock-or tag-out procedures and confined space training. CMMS software tracks material safety data for hazardous materials through spreadsheets, and maintains safety standards and ratings for flammability, health and emergencies. The software can store employee safety training information as well to ensure all onsite employees are up to speed on safety expectations. The computer systems help record maintenance personnel data such as skills, job categories, qualifications, work history and labor rates. CMMS offers preventive maintenance scheduling modules that aid in scheduling maintenance to prevent rather than repair problems. Some of these features include authenticating and tracking maintenance extensions and allowing for adjustments to upcoming due dates. They also generate preventive maintenance work orders. The software can also schedule repetitive work orders and send time-based reminders to the responsible parties so your technicians can’t forget to perform maintenance. 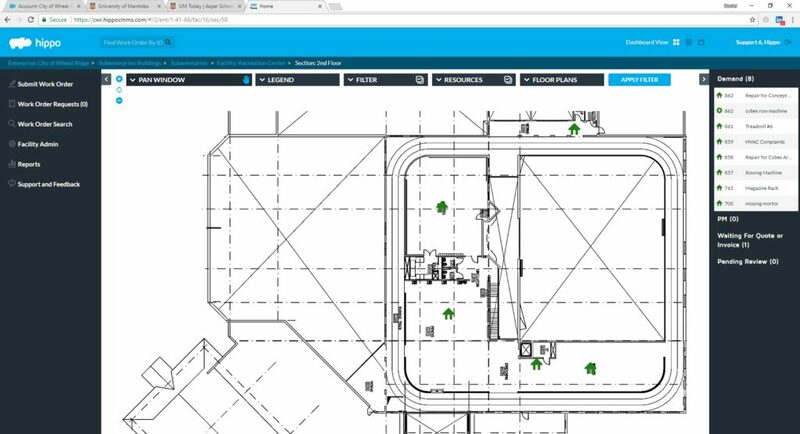 There are primarily four users of CMMS, namely facility maintenance, which helps companies repair and maintain buildings; production maintenance, which produces tangible products; linear asset maintenance, which are companies that take care of roads, telecom cabling and other assets; and fleet maintenance, which is the maintenance of vehicles. Choosing the best CMMS is a vital business decision, and comparing advantages and disadvantages of on-premise and web-based CMMS systems is a key step in the selection process. On-premise CMMS software is installed on an organization’s hardware system. Your business buys a CMMS license for users to access the software and any equipment needed. Sometimes, it is necessary to pay a third party for the installation process. However, having this type of CMMS allows an in-house IT team to have better control over the use and security of the software. It provides peace of mind that sensitive data is stored and handled internally as well. Since on-premise maintenance software offers more control over data and processes, large companies with strict compliance requirements often prefer this type of CMMS. This software can be easily customized and integrated with most systems. Even though a business faces a costly initial investment, on-premise software pays for itself over the long-term, especially as an organization expands. One of the biggest disadvantages of on-premise CMMS involves the required work to manage the software. It is necessary for an organization to provide the IT infrastructure for the application, configure the network for access and install upgrades or security patches.  Since the individual company is responsible for the system, it may take days to get back online after a hardware failure. What makes a CMMS web-based is a hosted service that is accessible from the Internet. There is no need for a company to install hardware or software directly, as it is handled by the vendor. This allows a business to focus on other responsibilities without the need to staff a large IT department. One of the biggest CMMS benefits of a web-based solution are lower upfront costs, unlimited scalability and no need to use new infrastructure. Also, the software provider does all the maintenance, including backing up data, providing security and performing upgrades. Employees can access this kind of CMMS system at any time, on the go via mobile devices and at any location. Since a web-based system is usually housed on multiple servers, it is highly reliable and available. Some disadvantages of CMMS hosted in the cloud are customization costs and security. It is generally easy to customize the CMMS to a company’s needs by inserting or removing modules or connecting to other integrated platforms, but not always. The costs of doing so can quickly pile up. As for security, because data is being frequently transferred to and from the cloud, it has more opportunities to be compromised. These security worries are often overblown. Even though many people feel cloud software brings security threats, it is less likely to be affected by security breaches because of the capital and clout behind most CMMS vendors. There is no local data to hack, and the software is regularly updated with security patches. Organizations must decide whether web-based or on-premise maintenance software is best for their business. Today, the costs of storage and bandwidth are decreasing, so cloud software is becoming a popular option. We took a survey of organizations buying CMMS software and got their input on deployment preference, and the majority prefer cloud-based deployment. Every CMMS offers similar features and modules. However, no system is right for every business. Since there is no perfect solution for all companies, it is essential to carefully weigh the pros and cons before making a final decision. Here is a brief guide to the selection process. First, you have to gather the specific requirements of your organization. For example, many CMMS systems offer property maintenance features — but if you don’t have properties, you don’t need a system that focuses on that. Extraneous features often come with an extra price tag that smaller companies can’t afford, so keep in mind that bigger isn’t always better. Check out our interactive requirements template to deliver your personalized needs to vendors and get exactly what you need from a CMMS system. The next step is to compare CMMS companies based on the features you have deemed important for your specific needs. A thorough CMMS systems comparison should break products down feature-by-feature to understand how well the system will meet your needs. We have a comprehensive CMMS and preventative maintenance software comparison matrix to help you get started on this step. After you’ve researched the different products, shortlist vendors based on how well they can deliver a product that meets your specific needs. Make sure to ask for trials or demos so you can take the software for a test run. The last requirement to consider is price — good software can be expensive, but it doesn’t have to be. 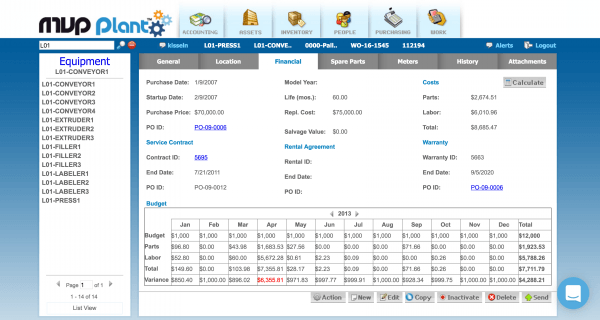 To see how industry leaders price their products, check out this CMMS software price comparison. The main benefit of CMMS software is that it helps management track activities of their maintenance teams, calculate expenses and allocate resources. CMMS improves accountability, reduces work outages, identifies the causes of certain problems and offers their solutions. The systems also control inventory, helping businesses save on purchases and reduce losses. To select the right CMMS system for your organization, you have to start by identifying your requirements and comparing them to the available features. Compare products by how well they match your needs, and create a shortlist of the best matches. You should find a range of products at a range of price points, so the final step is to try them out! This brief advantages vs. disadvantages CMMS selection guide should give you the confidence and resources you need to move forward in your software selection. Do you still have questions about the advantages of CMMS? Do you have a topic you wish we would cover? Leave us a question in the comments! This is really a very interesting article. I was able to finally distinguish the relative advantages and disadvantages of On-Premise CMMS vs. Cloud-Based SaaS CMMS. I will definitely take note of these differences when I encounter them. Thanks for sharing.